– are you scared yet? | brainsnorts inc.
– are you scared yet? This picture is not a product of Photoshop or anything like that. 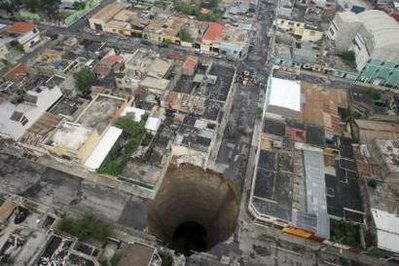 This is a sinkhole that pulled the rug from beneath a three-story building in Guatemala City, Guatemala. Amazingly, nobody was hurt. More amazingly, it happened. This fits in too well with the rash of apocalyptic movies that have been released over the past half a dozen years such as 2012, The Day After Tomorrow, and Knowing. It used to be easy to dismiss those films as a different type of “slasher” movie. Instead of teenagers in lust, it was Earth on the wrong end of the knife. Now we’ve got the oil disaster in the Gulf of Mexico, flash floods across the world, and city blocks getting sucked into the planet. Like it or not, Mother Earth is not happy, and her punishments are getting worse. June 11, 2010 in climate change, environment, flood, global warming.